Unfortunately, divorce associated with a situation when a couple has a child with a disability happens all too often. The facts are that parents of disabled children simply face a higher divorce rate as a result of their unique situation. Disabled children may often suffer more from a divorce than a healthy child. It can be very difficult when a couple is unable to reconcile their differences due to having a handicapped child. However, many married couples have often taken action to avoid breaking up and ending the marriage prior to making this decision that it is the right move for them. Having a child with disability can generate all kinds of unique challenges and can define different rules for both parents than what they had expected prior to having the child. Over time, parents must be able to rely on one another and to work together in order to support the child and to maintain a healthy relationship with one another. Unfortunately, as with any marriage, things do not always workout and this can be especially pronounced in a situation where there is additional stress, expenses and challenges associated with raising a child with a disability. Parents of disabled children frequently have higher than typical divorce rates when compared with parents of non-disabled children. Some researchers, for example, report that couples who have a child with autism have divorce rates as high as 85%. A disabled child can put a significant strain on family life and sometimes the wife or the husband may ultimately choose to leave the marriage because they feel they are no longer able to support the child the way that they currently do. It is important to consider the best interests of the child in this situation, but certainly a case where both parties are unhappy and arguing with one another is not in the best interests of a disabled child. 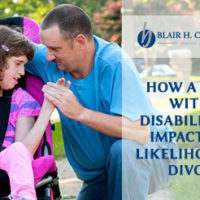 It is especially important to approach this issue carefully in any situation where a disabled child will be impacted by a marital dissolution. In the cases of children with disabilities and divorce, it might be necessary to appoint another person as the guardian prior to the child reaching the age of 18. Both disabled children and normal children become responsible for their actions and decisions after reaching age 18 because the law does not make any distinction. An appointed guardian may be critical for helping with financial and medical decisions associated with the disabled child. Many parents of disabled children will work hard to keep their marriage intact at all costs. Unfortunately, over time, this commitment can erode and can put unnecessary pressure on both parties or even increase problems for the disabled child. If parents are arguing all the time, for example, or if they are unable to communicate, this is often something that a disabled child can still understand and internalize to some extent. At this point, it becomes imperative to consider the best interests of the child. Although it might not seem like the most appropriate outcome at the time, ending the marriage and moving on may be in the best interests of the child, so long as both parties can agree to work together in order to come up with the most effective plan for parenting the child. As with all children going through a divorce, it is important to consider keeping as much stability as possible in the child’s day to day situation. Adding unnecessary stress and frustration for a disabled child can be extremely overwhelming. Likewise, both parents should agree about the language they are going to use present the divorce news and determine how they can work together to minimize the impacts on the disabled child. Coming up with a parenting plan that recognizes the needs of their unique child as well as the parents’ rights and responsibilities is critical. If you are thinking about getting a divorce, contact an experienced divorce attorney today.